What Ennis is currently known for are its people and its festivals, and boy do we know how to do festivals! Thousands of people flock from all over the world in April to see our 40 miles of rural bluebonnet trails, the “Official Bluebonnet Trail of Texas,” and enjoy shopping, entertainment, and family-friendly fun at our annual Ennis Bluebonnet Trails Festival. Our Czech heritage comes alive every Memorial Day weekend during the National Polka Festival, and we host many other charming hometown events like Ennis Autumn Daze, Parade of Lights, Blues on Main and Ennis Freedom Fest, which includes the Red White and Bike Parade and a spectacular fireworks show. For a rush of adrenaline make plans to attend the AAA Texas NHRA Fall Nationals at the Texas Motorplex to witness Nitro-burning cars go 330 MPH! Between the exciting events and the Farmers Market that takes place every Saturday from April to October, there is always something to do in Ennis that is family friendly and provides the perfect environment to meet new people and experience new things. Now is the time to mark your calendars and plan a trip to the great city of Ennis. Stop by the Ennis Convention and Visitors Bureau upon arrival for a welcoming smile and more information on all that we have to offer. 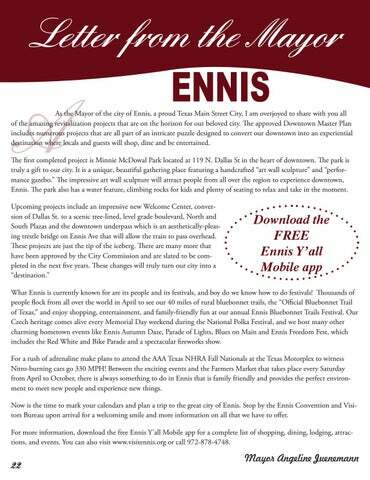 For more information, download the free Ennis Y’all Mobile app for a complete list of shopping, dining, lodging, attractions, and events. You can also visit www.visitennis.org or call 972-878-4748.